Harvard University's business school is working with a BBC radio station on a studio project that brings people together virtually from around the world to hold a live debate. The Business School is working with BBC Radio 4 to produce an episode of "The Global Philosopher." This program is hosted by Michael Sandel, a faculty member in the university's law school. Sandel, who teaches political philosophy, is the author of Justice: What's the Right Thing To Do, a New York Times bestseller, which was turned into a popular free online course and TED talk. He also hosted a Radio 4 series, The Public Philosopher, in which he roamed the world to debate with audiences about ethical issues, such as immigrants and borders and markets and morals. The new project will use Harvard's HBX Live studio, which allows participants to log in concurrently and join real-time case-based sessions with faculty members. A high-resolution video wall reflects lecture hall-style seating for displaying up to 60 people at a time. Everybody else can watch livestreaming sessions in an "observer" model. 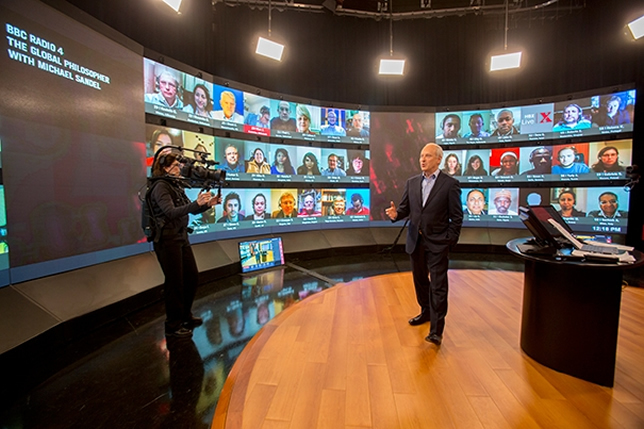 The sessions use roaming cameras to capture the lecturer as he or she moves around the space, as well as the students whose faces are displayed on the monitors. The studio is located in the Boston-based facility of public broadcaster WGBH. "This is an exciting opportunity to create a truly global public square," said Sandel in a prepared statement. "The HBX Live platform enables us to conduct video-linked discussions across national and cultural boundaries. It is a chance to think together, and to learn from one another, about the hardest ethical questions we face as citizens." During the first session, Sandel led a discussion on the topic of immigration and the moral significance of national borders. The radio station chose participants through a process that began by collecting a database of several hundred people from 65 countries, from which 60 individuals were invited to be on the interactive wall. Remaining candidates were asked to watch the live stream of the session and contribute through polls and chats. The recordings are available to view online and are broadcast on the radio station. "From its inception, we knew HBX Live would represent a unique opportunity to gather audiences from around the world for conversation and engagement," noted Harvard Business School professor Bharat Anand, faculty chair of HBX. "Working with Michael and BBC Radio 4 allows us to connect in a meaningful way with their audience around the globe -- people who are eager to learn about the key problems of the day and contribute their insights and points of view." Harvard and BBC Radio 4 said they hope to make further editions of the program.